This educational mini talking school book for toddlers features 12 incredibly detailed and touch sensitive pages that help teach children over 100 words is six categories. Great pre-Kindergarten toy for early education; four modes of play are also included, “What’s That Word, Letter Fun, Music Time and Find It”. Reacts to your toddler’s touch with sounds, music, and words this early learning centre teaches fine motor skills along with words, and ABCs. 3 Fun learning activities introduce letters, numbers, shapes, and much more. 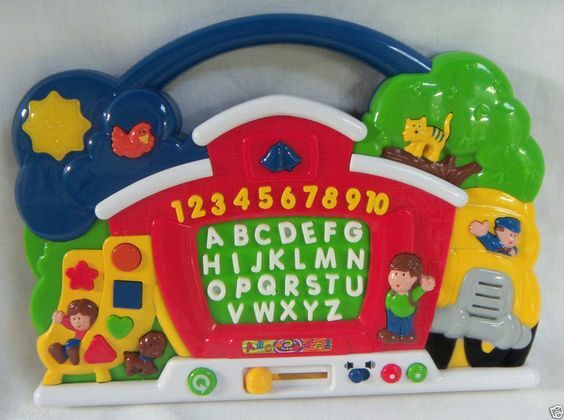 26 letter buttons clearly introduce the alphabet with stimulating sound effects. 5 shapes buttons to teach toddlers shapes and play nursery rhymes. 6 colourful 3-D figures each have friendly spoken phrases. 10 number buttons teach basic numbers; doubles up as a musical keyboard.